Spell -Elegance- as you dress up in this swanky tunic design brought to you by Snehal Creations. The beauteous piece comes is a stylish halter neck embellished with attractive bead-work embroidery in white and golden. The bead work also provides a fine finish at the cuffs and base of the tunic. 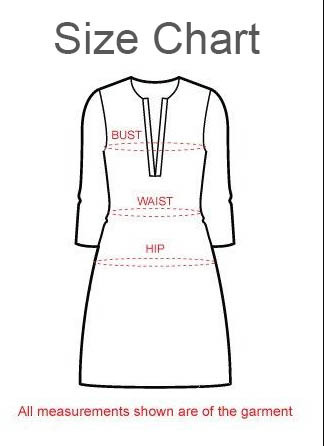 This short length Kurta comes with full sleeves. The fine crepe fabric makes it an ideal wear for all seasons providing it with inherent sophistication all along. Team it up with a contrast Salwaar and rock any party you want. This color contrast and design is definitely a rare find.